This slice of Detroit’s North Corktown neighborhood once enjoyed pleasant streets and good neighbors – that is, until a townhouse complex took a wrong turn and jeopardized the safety of the entire community. So says Jon Koller, who took it upon himself to turn around Spaulding Court and, by extension, the neighborhood it serves. Koller, a 27-year-old structural engineer, said that just two years ago Spaulding Court, a 100-year-old historic townhouse complex on Rosa Parks Boulevard, was a criminal hub. Exterior doors were kept in use by people running in and out to buy drugs; gunfire was a nightly occurrence. Neighbors were threatened as drug dealers’ clients broke into homes and stripped properties to trade for drugs. Joe Harris, 26, who lived in one of the townhouses for 10 years, said Spaulding Court wasn’t always a trouble spot. At the end of 2009, things started to change for the 20-unit complex when Koller and a few others who lived in area boarded up the structure after the property was seized by Wayne County. The group then started a nonprofit organization -- Friends of Spaulding, which Koller calls “not much more than a block club” -- to buy the complex and turn it around. Koller, who serves as president of Friends of Spaulding, couldn’t quite explain why he felt the need to take on this project. The price tag -- $1,000 – was low, but the challenge -- leaky roofs, fire damage, sparking electrical meters and burst water pipes – was not. The first order of business for the group was the permit fees. “We were trying to raise $50,000 to build a couple of units and we were looking at the budget for them and permits cost like 10 percent. We were like, this is a big cost, maybe the city will be willing to finance it and we will pay them back once we generate some income,” said Koller. The Buildings and Safety Engineering Department approved Friends of Spaulding’s request to defer payment of the fees for a time, but when the group asked if the department could extend the break to all in the city, it was shot down. 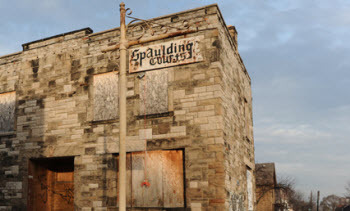 With grant money, donations, fundraisers, loans from individuals and many volunteers, Friends of Spaulding was able to repair most of the major problems at Spaulding and attract tenants. Harris, who is also a member of Friends of Spaulding, said he just had to get involved with “bringing Spaulding Court back to life. When Bridge visited, five of the 20 units were occupied. Almost all units offer three bedrooms, with a typical rent of $1,200. However, Friends of Spaulding developed a model that is flexible enough to work with all of the tenants. Besides fixing up Spaulding, Friends of Spaulding also hosted many weekly fundraisers like Soup at Spaulding. Friends of Spaulding won a little over $1,000 in a November Detroit SOUP competition. This is fantastic, but one thing that isn't mentioned at all, and something that really needs to be discussed is: How did you deal with the drugs, drug dealers, prostitution, and other dangerous criminal activity? It seems a little glossed over in this article. Other attempts at neighborhood revitalization have met with violent resistance (such as FireWeed UniverseCity on Goldengate)... drug dealers don't normally like being run out, and intrusion into their territory is often met with gunfire. Was this an issue? Did the drug dealers just "evaporate"? They had to go somewhere... I can't imagine that kicking them out was exactly a "handshake" sort of deal. I'd be fascinated to hear that side of the story, because it's a very real and valid concern to others who want to revitalize distressed properties and neighborhoods.